If you like chocolate crunch bars, these healthy Chocolate Quinoa Crisps will be your new best friend! They’re vegan, no bake, and SO FUN to eat! Summer is peak time for no-bake treats. It’s hot. It’s sweaty. People are avoiding their ovens and their kitchens like the plague. I get it. But I want cookies. What’s a girl to do when she just wants some damn cookies? Dun dun da daaa I made no bake cookies. By now you guys know alll about my no bake treat obsession. Bars to balls to cups to freezer fudge. GIRL, the list goes onnnn. So if you’re like me and need a chocolatey treat… like all every day… then I have the recipe for you! GUYS. 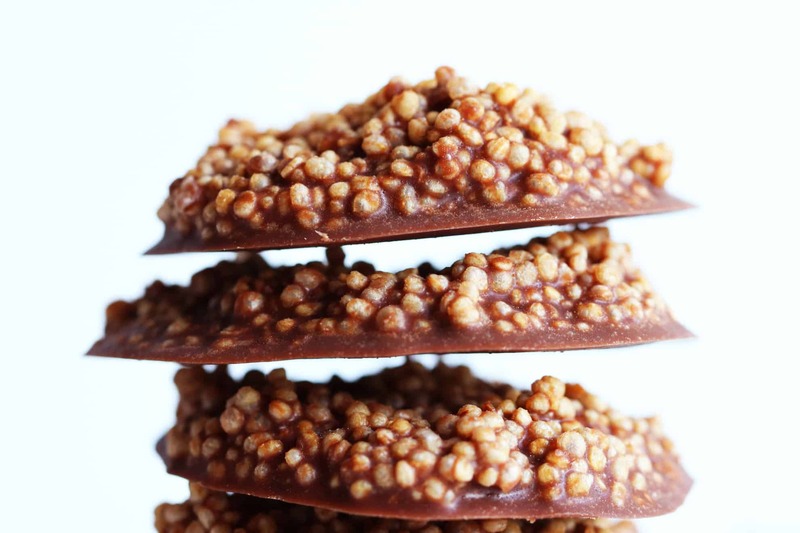 Chocolate Quinoa Crisps. Learn it. Live it. Love it. These will be a fast favorite among kids and adults alike. If you like chocolate crunch bars. If you like rice krispie treats. 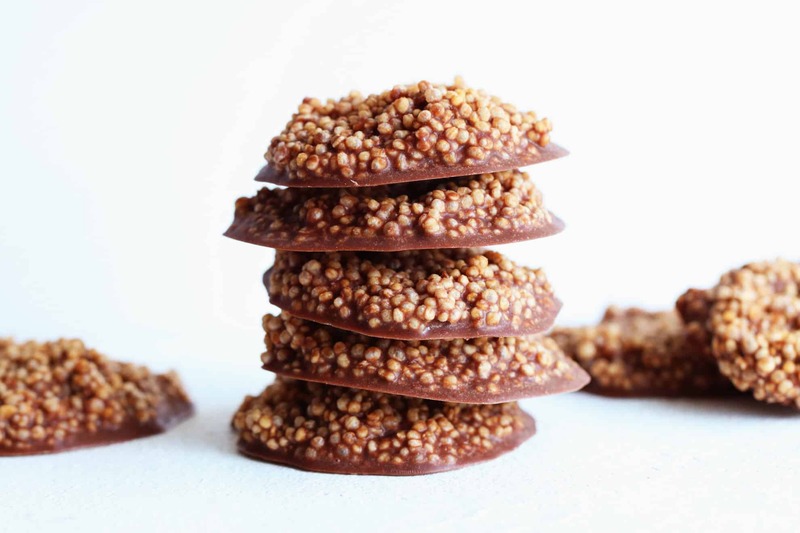 If you like easy desserts that basically make themselves, you will LOVE these Chocolate Quinoa Crisps! FIVE ingredients you’ll need for this recipe are: 1) Puffed quinoa. The one I was buying from amazon has stopped selling it. So I now buy it HERE and have been really happy with it. 2) Agave nectar. This keeps it low glycemic, but if you don’t care too much about glycemic index, you can swap in honey or maple syrup. 3) Vanilla extract. Nothing really else to say about it. 4) Refined coconut oil. I like refined because it doesn’t have as much as a coconutty flavor, but any coconut oil works! 5) Cocoa powder or cacao powder, whichever you prefer. In your bowl, whisk together the coconut oil, agave nectar, vanilla, and cocoa powder until smooth. Fold in the puffed quinoa. Use a cookie scooper to scoop about 8 mounds on a lined baking sheet. Use your fingers to gently press the tops to flatten them out. Pop in the fridge or freezer for 1 hour until harden. Transfer to a bag or container and store in the fridge until you’re ready to eat! In your bowl, whisk together the coconut oil, agave nectar, cocoa powder, and vanilla until smooth. Use a cookie scooper to scoop about 8 mounds on a lined baking sheet. I’m totally making these like ASAP! I have a question that may sound kind of silly but the quinoa is uncooked straight from the package right?? This looks beautifully delicious! My question is that it looks like it’s dipped in chocolate on the bottom since the chocolate looks solid and flat under the crisp. Is that just how it shapes? The flat part is just how the chocolate forms! You don’t don’t have to do any extra work, they just take on that shape 🙂 Hope you love them!! 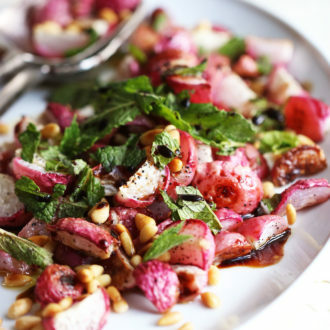 These look fabulous and I’ve ordered puffed quinoa just to make them. Question though; I have liquid coconut oil. Will that work or do I need the solid form? Whoa good to know!! Thank you! I’m allergic to coconut and have a hard time making any kind of heathy baked goods or non baked goods. Does anyone know of a healthy alternative? Unfortunately I don’t think there’s a good sub for coconut oil in the recipe. Because coconut oil solidifies when chilled, it’s essential for the crisps to take on their form. The only other alternative I can think of is cocoa butter which you can buy online or in health food stores. I’m not sure if that would work for your needs, but it’s another option! I’ll keep thinking and let you know if I think of anything else! Can I use butter or vegetable oil instead of coconut oil? Unfortunately no, there’s no good sub for coconut oil in the recipe. Coconut oil solidifies when it’s chilled which is essential in this recipe for getting the crisps to form. The only sub I can think of would be cocoa butter because that acts similarly to the coconut oil. I’ll update this recipe if anything comes up that would be a good alternative. These look great! Does coconut oil have to be used? Is there something else that can be used like regular oil? Because of the nature of coconut oil – how it solidifies when it’s chilled, using coconut oil is essential to get them to form. I can’t think of anything else that would sub for coconut oil, maybe cocoa butter! Thanks for sharing where to buy the puffed quinoa, I will be making this as soon as it arrives! 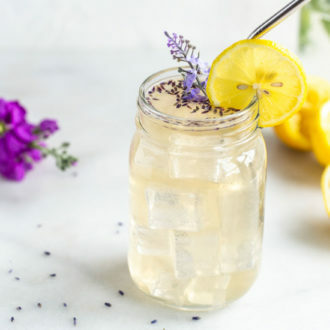 What about maple syrup or honey as a sub for the agave nectar? this recipe looks amazing! I was just wondering before I attempt to make it, how long would it take to make ? This looks INSANELY good, i didn’t know you could puff quinoa, COOL! i thought this was an amaranth only thing. this – “by the looks of it”.. seems to be less sensitive to being burnt. Thanks for sharing an awesome recipie! I hope you love them!! I’ve never been able to successfully puff my own quinoa, it always burns for me. If it works for you, PLEASE let me know your tricks!! This is such an easy and delicious treat, enjoy!! I made these, and they were great. Awesome healthy alternative to chocolate. I did, however, notice that the puffed quinoa wasn’t at all crispy, which is what I was expecting. Wondering if I bake the puffed quinoa in the oven for a bit, do you think it will get more of a crispy/crunchy feel? These ended up being great for Passover (yay for quinoa being non-chametz), but I missed the “puffed quinoa” part of the ingredient list and bought regular quinoa that I had to toast/puff myself. Even with toasting/popping the uncooked quinoa, it was still maybe a little too crunchy, but overall the toasted quinoa gave my cookies the effect of an ultra-crunchy Crunch Bar (which isn’t necessarily a bad thing). I made the chocolate as directed but added in some melted milk chocolate morsels for extra chocolate-yness, and it came out delicious. Thanks for the recipe.